Welcome to the official Paul Barrett, website. I'm an Electronic Music Composer & producer, I started making synthesizer music many years ago, influenced by the likes of OMD, Kraftwerk, Thomas Dolby, Gary Numan, Bill Nelson & Depeche Mode. Lots to hear and see, so get clicking! Don't forget to check out my 'YouTube' videos in 'The Studios' link above. The 'Our Story' page is where you'll find a full and complete history on Paul Barrett & Fayshalarts, synths I've used and are currently using, my claim to fame and how it all began. Check out 'The Music' section to hear my music ! 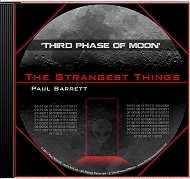 The latest 'Third Phase Of Moon' album is available to download from iTunes, Amazon and Music Streaming Services.